When vitamins were discovered a mere century ago, they changed the destiny of the human species by preventing and curing many terrifying diseases. As a result, it wasn’t long before vitamins spread from labs of scientists into the realm of food marketers and began to take on a life of their own. The era of “vitamania,” as one 1940s journalist called it, had begun. Today, we all think we know about vitamins — we buy products for the vitamins they contain, after all, and we feed vitamins to our kids. But in reality, most of us know nothing about vitamins. And we certainly don’t recognize how these 13 invisible chemicals affect nearly every decision we make about food. In Vitamania, award-winning journalist Catherine Price takes readers on a lively journey through the past, present and future of these mysterious micronutrients — an adventure that includes poison squads and political maneuvering, irradiated sheep grease and smuggled rats. Part history, part science, part personal exploration, Price's witty and engaging book reveals how vitamins have profoundly shaped our attitudes toward eating, and investigates the emerging science of how what we eat might affect our offspring for generations to come. "I get sent a lot of books about food. I usually don't write about them. Upon opening Vitamania I was pleased to find myself wanting to keep reading. It's measured, funny and fascinating. The only thing that Catherine Price is selling here is good reporting, engaging storytelling, and more than you thought you could possibly learn about vitamins. If you need vitamins to survive (you do), you should read this book." 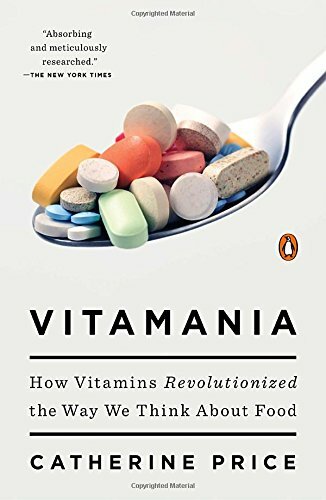 "[A] hidden, many-faceted, and urgent story... a commanding, meticulously documented, and riling exposé rich in dramatic and absurd science and advertising history, lively profiles, and intrepid, eyebrow-raising fieldwork"
"This lively investigational work from journalist Price reveals how little we know about vitamins — both how much we need or how they work — and how our vitamin obsession is actually making us less healthy." "[A] deeply satisfying masterpiece of nutrition science writing." "Catherine Price gives us a journalist's entertaining romp through the fascinating history of the discovery of vitamins, and their use and marketing as objects of health obsession. Faith in vitamins, she advises, should be tempered by scientific uncertainty and dietary complexity, and the understanding that foods are better sources than pills." —Marion Nestle, Professor of Nutrition, Food Studies and Public Health at New York University and author of What to Eat.